White Dragon Horse | Monkey Magic! 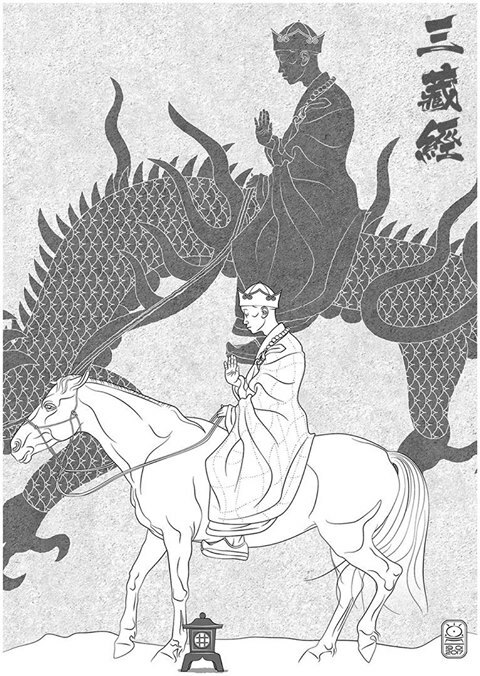 Tripitaka riding on the White Dragon Horse by Dan Barker. In the novel Tripitaka’s white horse is the son of one of the Dragon Kings of the Four Oceans, who gets into trouble for burning down a castle. Guan Yin saves him from execution on the promise that he will provide a service later on. He goes to live by a river and he encounters the pilgrims as they try to cross it. Giving into his fierce Dragon nature he eats Tripitaka’s horse, and a ferocious fight erupts between him and Monkey, Pigsy and Sandy. Eventually he realises that they are disciples of Guan Yin and manages to get this across to the Pilgrims. The fight stops and the Dragon pledges to carry Tripitaka to India without complaint and turns into a white horse. During the course of the novel the horse only turns back into its Dragon form once to save Tripitaka when Monkey abandons them. 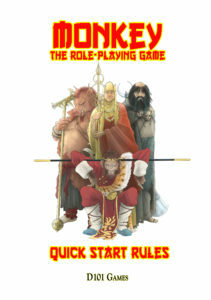 This write up assumes that the Horse takes a more active role in the adventure, and is in effect for the purpose of the game a fifth Pilgrim. 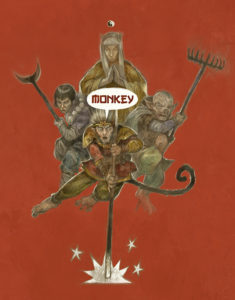 The 1970s/80s Japanese TV series (known as Monkey Magic! In the UK) has the Horse take human form in just this way. This write up also assumes that the Horse uses the Horse Whip, part of a magical set of horse tack along with a saddle, stirrups etc. given to Tripitaka by Guan Yin, as a magical weapon. Weakness: Given to expressing his Savage Dragon Nature.